It’s that time of year again for backyard BBQs, American flags, and fireworks shows. 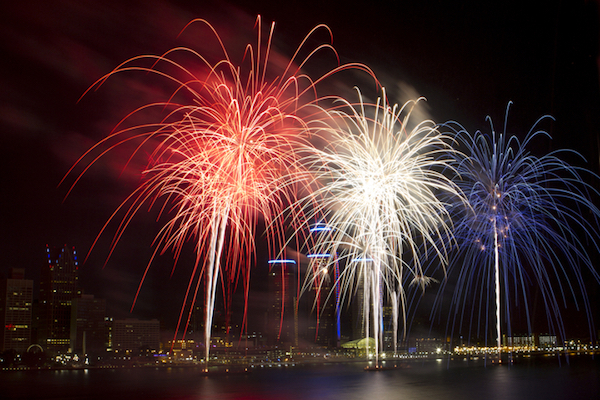 While we love watching fireworks, we like photographing and sharing them even more. But moving lights are a tricky target to capture, so you’ll want to be prepared before you grab your phone or camera. Our resident photographer Tim Hampson shared his tips for capturing the best Instagram-worthy fireworks photos. You don’t even need a fancy camera to get the perfect shot. Turn off the flash. You won’t need it and you don’t want unnecessary light ruining the photo. Turn on HDR. This camera mode takes several pictures at once and combines them into one best image. You can find it on most smartphones. Don’t touch the zoom. It’s tempting to zoom in for a closer view, but you’ll end up with grainy-looking photos. Use burst mode. Use this setting to press and hold the shutter button to take many photos at once so you can capture the perfect fireworks moment. Grab a tripod. For the best shot, keep your phone steady with a tripod. Most are small and easy to use with any phone. Try slow motion video. Fast moving fireworks look extra dramatic in a slow-motion video. Use a tripod, plus a timer or wireless remote. You don’t want the camera to move while you’re shooting fireworks, so use a tripod to keep it steady. Then, trigger the shutter with a timer or remote if you have one, so you don’t risk moving the camera by touching it. Set the camera to Bulb mode or choose a long shutter speed. This will let the camera capture the entire fireworks burst, which will get all of the streaks of light as they move in the sky. Turn off autofocus. The camera might struggle to focus on the fireworks as they move with autofocus, so set it manually and leave it for the entire show. Set the camera to a low ISO, such as 100 or 200. This helps make sure you get clean shots that don’t look grainy. Get out there and shoot some awesome photos this 4th of July, and if you share them on Instagram or Twitter, tag @speckproducts so we can see them!